When items are left in the shopping cart and idle for 1 hour, the system will automatically send you an email reminder. A time-out email will be sent to you when the cart is inactive for 3 hours. All selected items have been removed from the cart. If you would like to continue shopping, please go back to our site and re-select the items again. But we cannot guarantee the availability of stock. 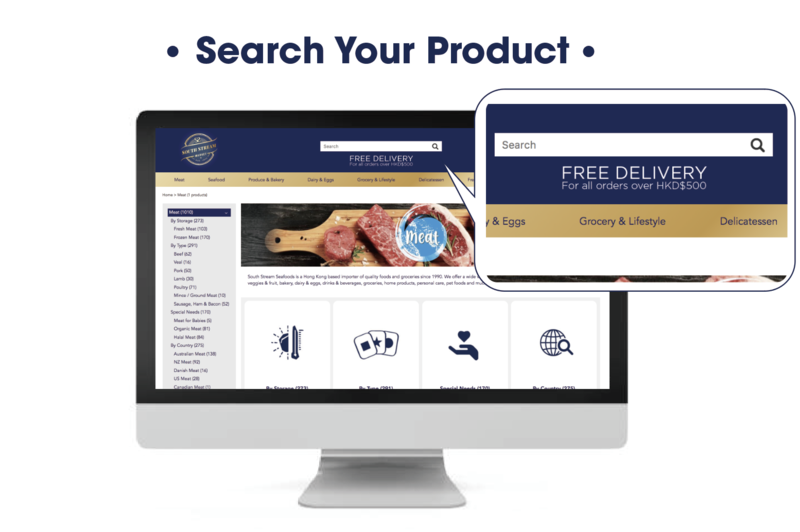 Fresh seafood & meat and other highly perishable items are uploaded twice a week. Generally, this is done on Wednesday and Saturday mornings around 11:00. Please subscribe to our newsletter to get the latest news straight to your e-mail box. Some fresh, chilled and perishable items are only available for delivery on certain days. If you choose a delivery day outside of those specified dates, it would no longer be fresh or good to eat. And you will not see the item in this case. The cut off time for Monday delivery is on Sat 09:00. The other day will be 14:00 before the delivery date. 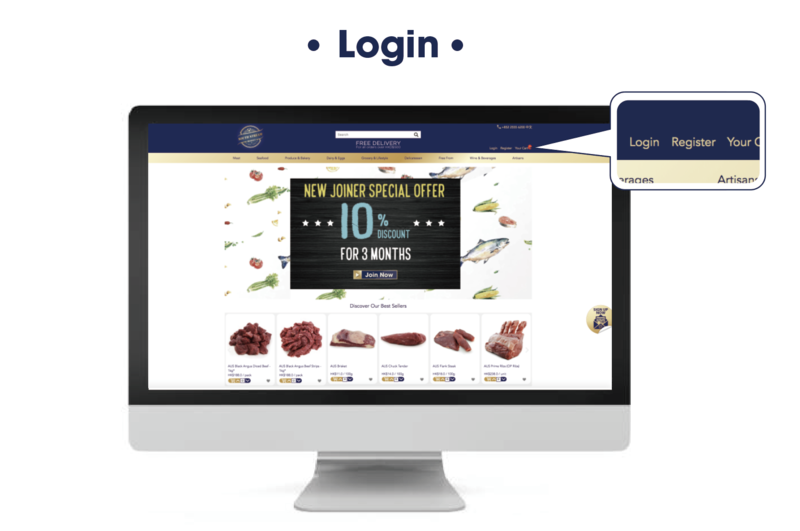 Login: Create an account for new customers. For registered customers, log in to your account. 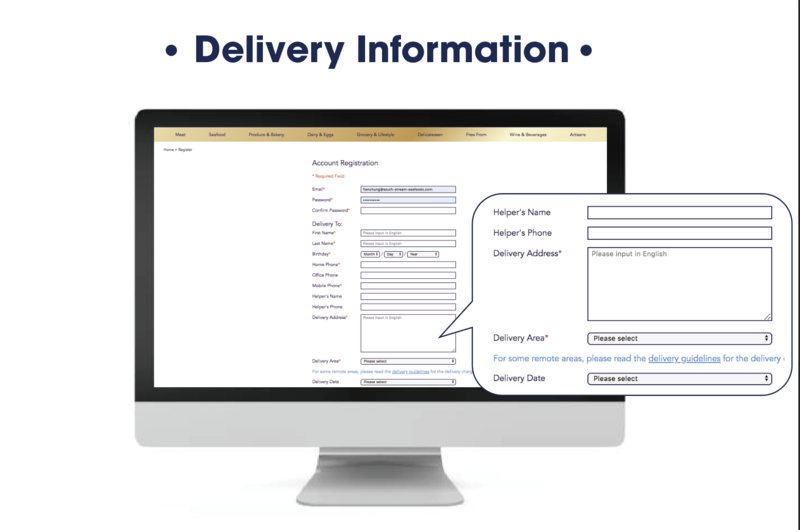 Choose Delivery Information: Choose the delivery area and select a delivery date. Choose Your Product: Select the products by category bar, click into the product range and the product page. OR You can simply type the product keyword on “Search Bar”, which is the fastest way to find the specified product. Read the product description for more details. Simply press “+/-” or fill in a quantity to add to cart. 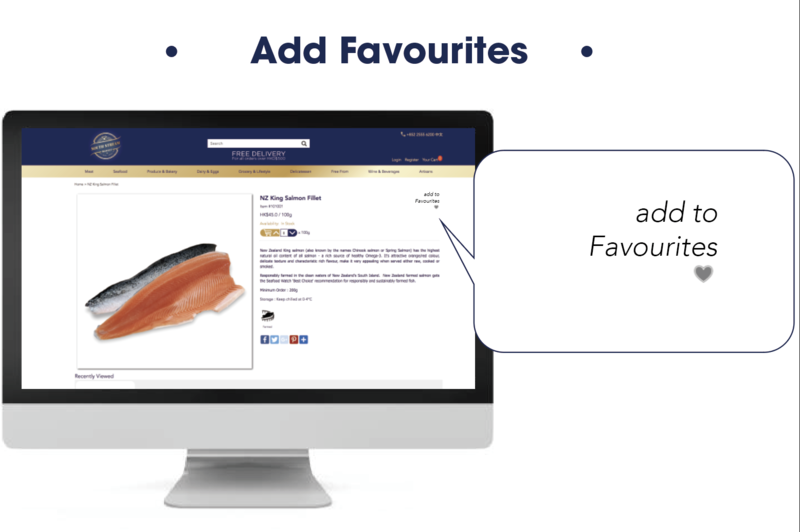 Add Favourites: Click the “heart” to add to favourites for consideration or easily repeat ordering. 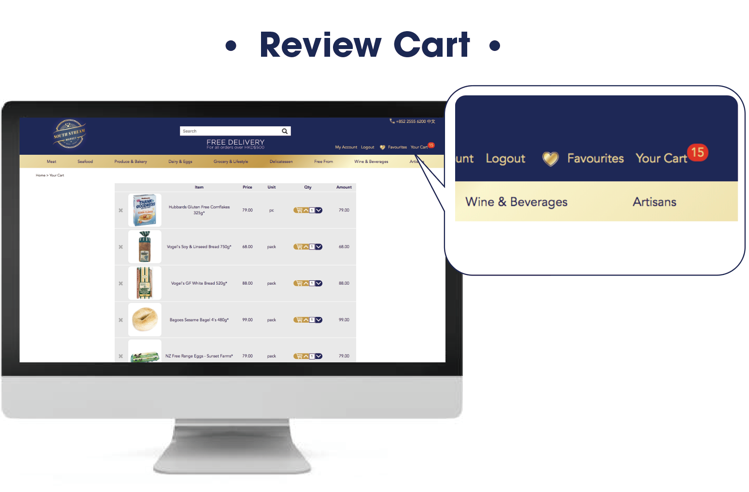 Review Cart: Click the “Cart” button, use the "Qty" column to remove or change the quantity of a product. 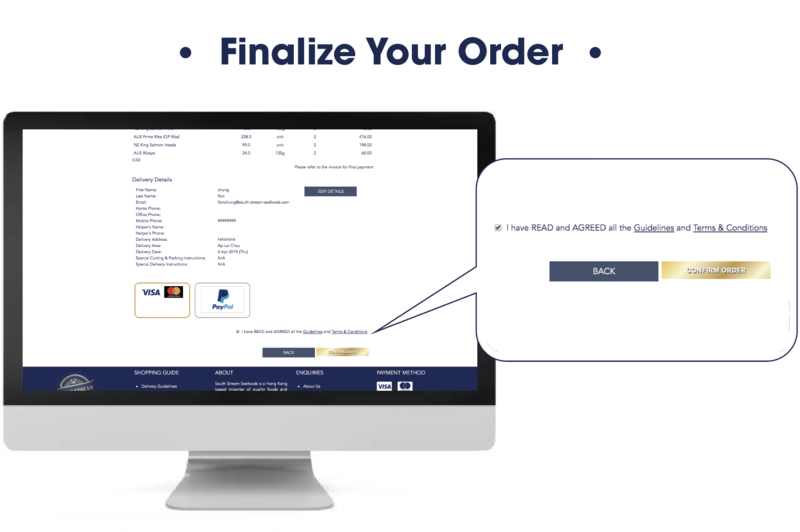 Click “Continue Shopping” button back to shopping or click “Checkout" to proceed to the next stage in the checkout process. If you don’t have any changes, simply click the “Checkout” button instead of “Cart” button. You still can review the cart but can't make any changes in this page. If you find something wrong on the quantity, simply click “Edit Products” button to return to the cart. 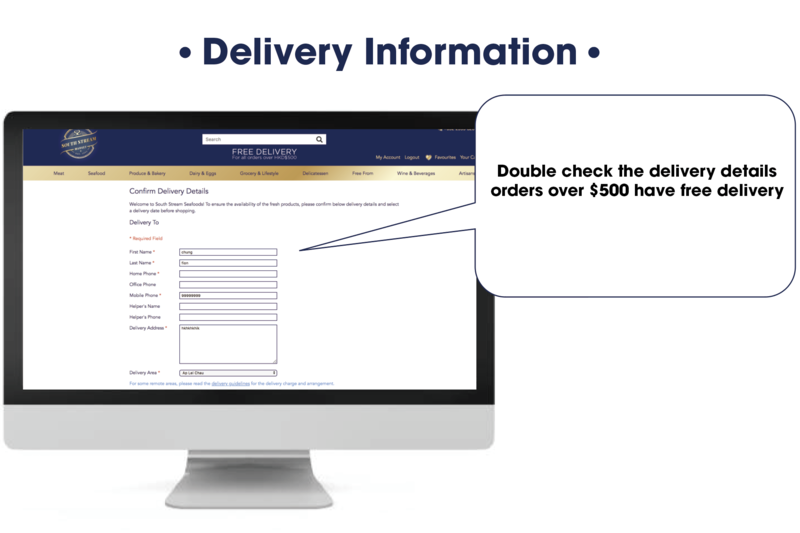 Delivery Information: Double check the delivery details and charge (if any). Minimum Order Amount: $300 (+$55 delivery charge). Most orders over $500 have free delivery. Due to longer travel distances and the time required to deliver to some locations, minimum order amounts are higher in some remote areas. For example: minimum order amount for Shek-O, Big Wave Bay and Po Toi O is $1,000. 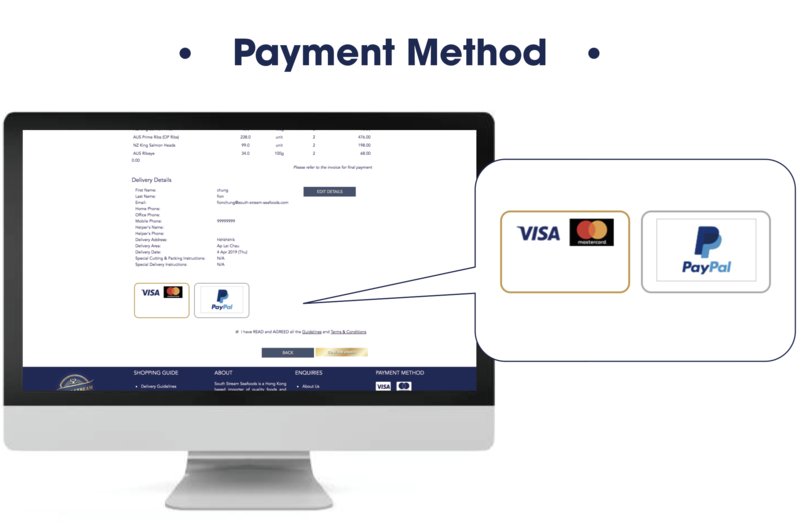 By Cheque: We will collect payment at time of delivery. Cheque made payable to: South Stream Seafoods Ltd. Post-dated cheques will not be accepted. By Cash: We will collect payment at time of delivery. By Bank: Transfer to HSBC A/C no. 499-808079-838. 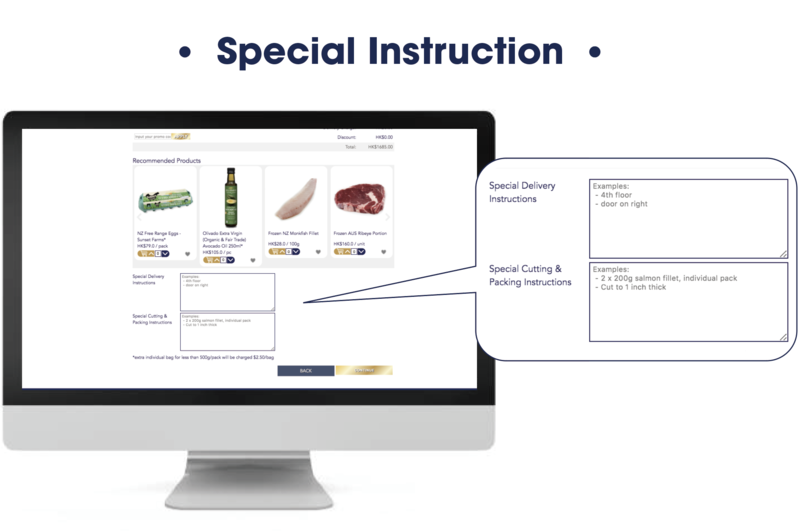 Special Instruction: Tell us your special cutting & packing instructions and special delivery instructions by filling in the relevant box. Click “Continue” to next step. Order Confirmation: You will receive an order confirmation by email shortly. Please be reminded that the total amount on the order confirmation is for reference only. Don’t make any payment before you receive the invoice. 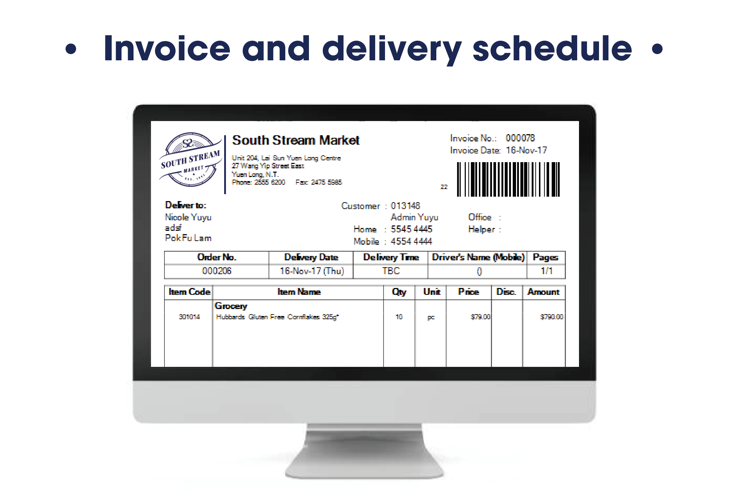 Invoice and delivery schedule: Invoice with the estimated delivery schedule will be sent to you a day before delivery at around 5:00 pm by email. Payment: Please make the payment after you receive the invoice. Delivery Arrangement: Please check the estimated delivery schedule, which will be updated on the day before delivery at around 17:00. 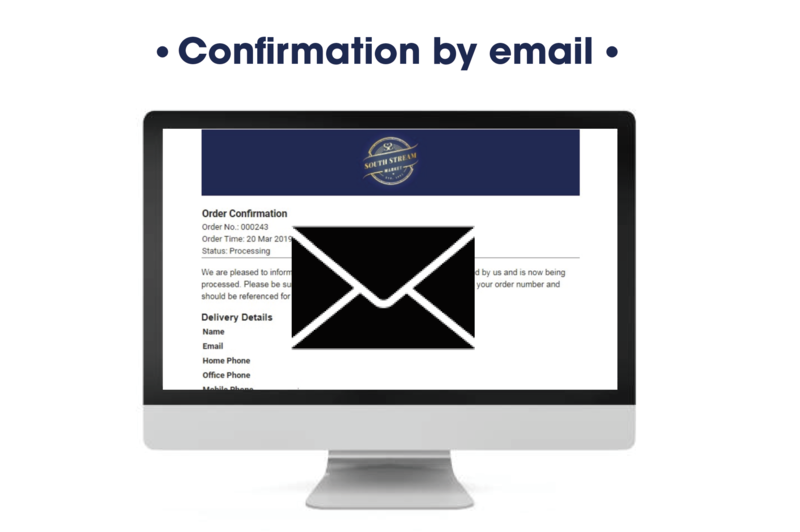 Check Upon Delivery: Please check the contents of your order upon delivery as it's assumed that your order has been fulfilled once the invoice has been signed. If you have an issue with our products or services after delivery has been accepted, please contact us within 24 hours.